Boundary Surveys - Stamski and McNary, INC.
Boundary surveys determine the precise location of the boundaries of a property. Surveys may identify encroachment on properties by buildings, structures, fences, driveways and other physical features. Easements for various purposes are often identified in preparing plots of the results of boundary surveys. In order to perform accurate surveys, detailed research is performed at the respective Registry of Deeds for the subject property and abutting properties. The determination of boundaries is not always readily apparent and in some cases gaps, gores and overlaps with adjacent properties are revealed. Our firm has demonstrated competence in performing thousands of boundary Surveys throughout Massachusetts for all sizes of parcels. Boundary Surveys are a fundamental part of an owner’s understanding of property rights and development potential. The Acton 9/11 Memorial was dedicated to Acton residents Amy Sweeney and Philip Rosenzweig who were both on American Airlines Flight 11 and recognizes public safety personnel. With the help of the Sweeney and Rosenzweig families along with the 9/11 Committee and Stamski and McNary, Inc., a design was developed to bring a piece of history, reflection and dignity home to Acton. The memorial features steel from the world trade center that was dispensed by the Port Authority of New York and New Jersey. 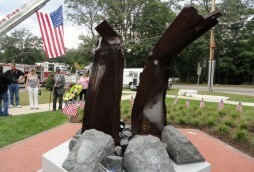 It was dedicated on September 11, 2011, the ten -year anniversary of the fateful day. ©2019 Stamski & McNary, Inc.